Today was a good day. It started out crazy with power outages, chicken chases, sick kids and getting to work late but the middle part was good. On my way home I stopped by Deseret Industries to drop off a bunch of stuff I cleaned out of my garage this weekend. An old rug, a box of holiday decor, some old shoes and two bags of my husband's clothing. The man who helped me was very friendly. He was covered head to toe in some mighty impressive tattoos and we joked about the "Ho Ho Ho" Christmas sign that got broken on the ride over leaving only "Ho"...he helped me unload everything, chatting away and then wished me a good evening. Little did he know that inside those bags were my husbands church shirts and the ties he wore every Sunday when he served as the Bishop of our ward. The jeans he wore when we went and saw Coldplay together, the t-shirts he wore when we ran our Saturday errands together. The Christmas pajama pants he wore during the holidays. We kept the "Jolly Old Elf" t-shirt that went with them. I wanted to tell the tattooed man about the precious bag I was handing him. I wanted to tell him about my husband and what a good man he was. How we loved and miss him so much we can't breathe sometimes. I wanted to share everything about the man I love, the Father of my children, the Grandfather to my grandchildren. I should have but I didn't. He wouldn't understand, or maybe he would. He seemed like he may know of hard things. Maybe he's experienced a loss of his own at some point. I will never know. He handed me a receipt and I drove away. You see. I know Gary wouldn't give a darn about those earthly things. He knows of Heavenly things now. Of promises made by a loving Heavenly Father who suffered the loss of a son. Of a Savior who loved us so much he died for us. I pray to remember these things as we go through our trials. As I posted this picture I read Steve's story below. 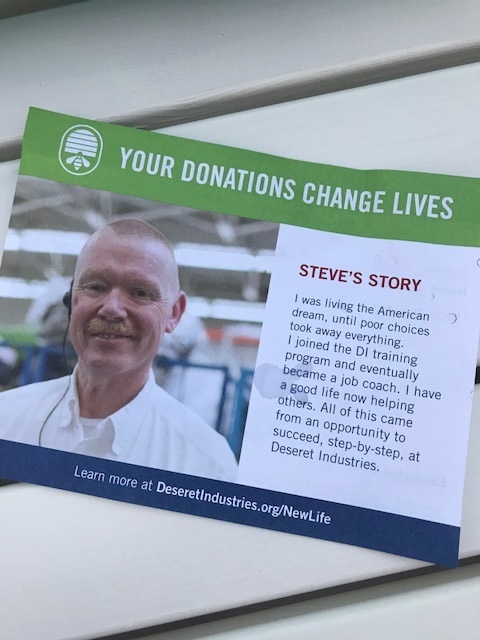 Our donations change lives. May my husbands clothing bring someone to a good life, a second chance and better opportunities. Gary would want that.